give a makeover to the simple steamed rice by adding cumin (jeera) and some fragrant spices. this restaurant style jeera rice recipe is mildly spiced, fragrant and tastes too good. 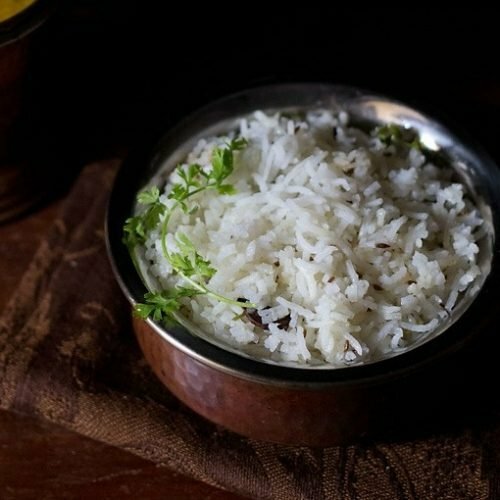 recipe post shares two methods of making jeera rice. choose the recipe method that suits you. rinse basmati rice till the water runs clear of starch. soak the rice for 30 mins and then drain all the water. keep aside. heat 4 cups water till it comes to a boil. add all the whole spices. add rice and salt. simmer the rice on a low flame uncovered. the rice grains should be cooked till tender and yet separate. drain the water and keep the cooked rice aside. if you want you can rinse also the rice with water at room temperature. this stops the cooking of the rice and keeps the grains separate. heat oil in a small pan. add cumin/jeera. let them crackle. they have to be fried well otherwise you will taste uncooked cumin in the rice. add the green chilies. stir for a few seconds. no need to brown the chilies. add the tempering to the hot or warm rice. with a fork, gently mix the tempering with the rice grains. even if some rice grains break, its alright. do gently taking care so as not to break the rice grains. add coriander and gently mix or garnish jeera rice with coriander at the time of serving. serve jeera rice hot or warm with a dal or vegetable/paneer curry of your choice. if using leftover rice, then you will need about 3 cups of cooked rice to use the same proportion of ingredients as mentioned in the recipe.